The fantasy genre has occasionally offered us glimpses of strange and incredible cities. Urban environments that seem anchored in reality, but far outstrip anything we may have encountered in life. If you're interested in this kind of thing, you may have some favourite locations that really stand out in your memory. Fictional places where your explorations seemed so vivid, you can almost imagine you were there. For me it's towns like Gormenghast, Kharé, New Crobuzon, Hammerhal and of course Mordheim. Twisting, dangerous municipalities, where the weird and exceptional is often considered entirely normal. Cities like this may boast cobbled, winding streets that rarely lead where they seem, or endless seas of undulating rooftops, where chimney stacks create forests out of stone, or foreboding, crenellated walls that, as much as keeping intruders out, could equally be holding something darker and more nasty in. Games Workshop has recently announced the release of its Age of Sigmar skirmish game, Warcry. This looks to be set in what could potentially be another of these exciting, visceral cities, Varanspire, and it seems there will be a new range of fantasy, urban terrain to accompany it. 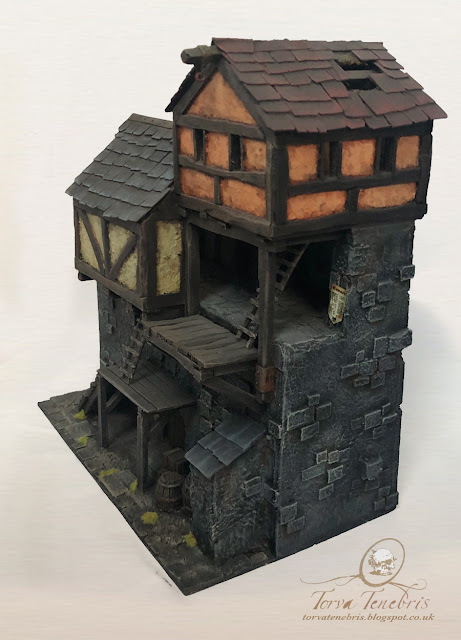 Following on from last week's model tree, I thought now would be a good time to share another piece of my old, scratch-built Warhammer scenery. A modular wall-section that is very much based on how I imagine one of these cities may look. 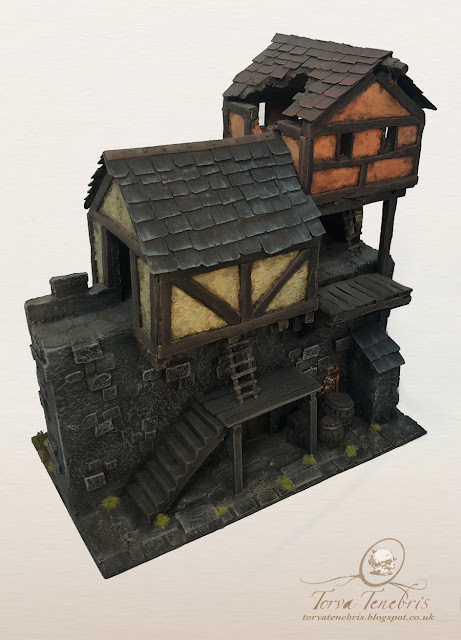 All my fantasy terrain was conceived to sit together – or at least to not look totally out of place when next to one another. The idea was that I could use different combinations of pieces to build a variety of locations. I had hoped that one day I'd have enough bits to build anything from a graveyard to a farm, a small village, or the aforementioned, twisted, inner streets of one of those dark and oppressive cities. Of course, like all my projects, much of this is still a dream, but that's not to say I didn't finish anything at all. This wall section, named the crow-walk by my six year old son, is meant to be part of castle, a citadel or a keep. I wanted it to be able to represent buildings in a variety of different states, so I settled on the idea of damaged roofs. When placed next to buildings in tip top condition, they will hopefully make it appear only slightly more run-down, but, with a little luck, when placed among ruins, the broken roofs should help portray the idea of a sacked or neglected settlement, or even one recently overrun by the forces of Chaos. 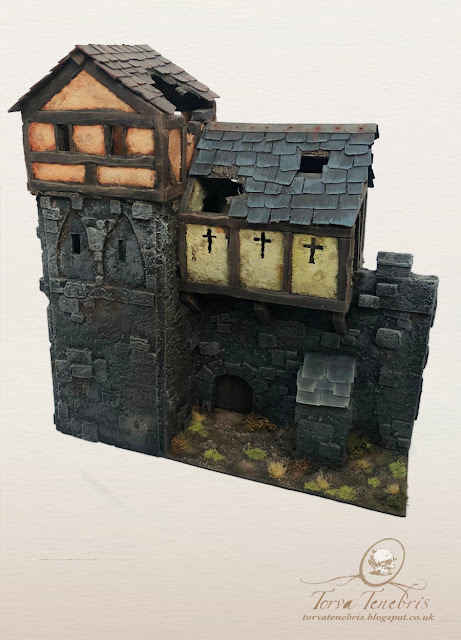 The model is based on a polyboard frame, that has been detailed with card and balsa wood, then textured in places with polyfilla mixed with sawdust. I added some barrels and ladders (that I picked up from a third party seller at Salute many years ago), and some tattered and torn posters that I slapped together in Photoshop and printed out for this purpose. The roofs are removable to allow access to the inside. This is one of my larger models, but there are a few other bits and pieces in my back catalogue – including at least one that was designed as a counterpart to this, and may even be slightly larger. I'll try to share this and some of the other items over the next couple of months.